Catalina Island is a magical destination and one of the most rich and abundant natural resources in California. 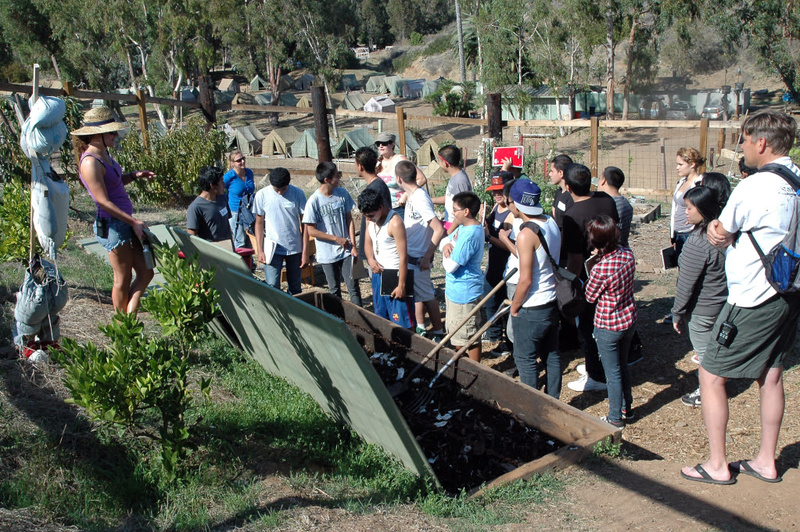 When visiting Catalina Island, which is less than twenty miles off short Los Angeles, students have the opportunity to participate in a wide range to educational and adventurous marine biology activities, such as snorkeling at one of the most desirable locations in the world, kayaking, dissecting squid, trawling for plankton and then observing them beneath microscopes, hiking the various trails that surround the camp, and lots more! While snorkeling students get to see Garibaldi, opaleye, kelp bass, leopard sharks, shovelnose guitarfish, as well as the occasional seal, sea lion and/or dolphin visit! On land students may seem several endemic species of birds and mammals such as the quail, ground squirrel and fox. Catalina Island is seventy-four miles of ecological preserve, with some of the most breathtaking landscape in California. 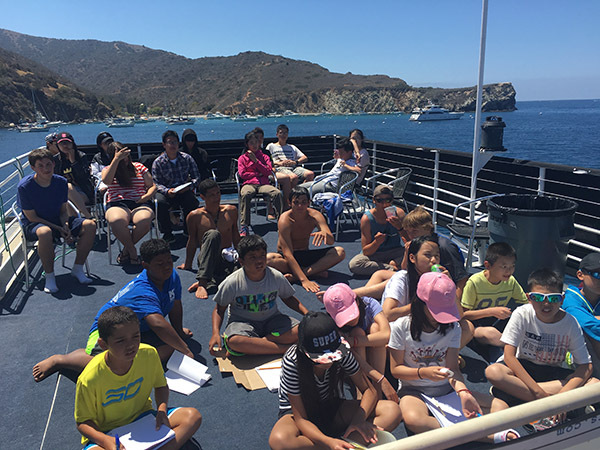 Marine biology youth camp at Catalina Island is a rare and extremely valuable opportunity to immerse your students in the unspoiled beauty of nature. With forty-eight miles of coastline, Catalina Island has a seemingly endless variety of marine and terrestrial habitats. There is an abundant of plant and wildlife, which makes this an ideal location to impart a passion for learning natural science and use the scientific method to explore nature, and arrive at your own conclusions and theories. For those interested in marine biology, camp at Catalina Island is the perfect chance to develop that interest and ‘try out’ life as an actual marine biologist field scientist. Students learn to keep a field journal and are taught to observe the world around them through the eyes of a scientist. This full immersion into natural sciences sparks a deep love and appreciation for marine biology, and many do end up going back home and pursuing an higher education academic goal. Just eighteen miles off the coast of Los Angeles lay Santa Catalina Island, one of the largest island nature reserves in the world. With over 74 square miles of breathtaking landscape, Catalina Island is one of the most valuable natural resources in California. 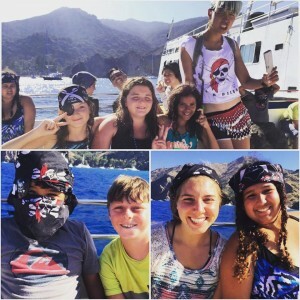 Mountain and Sea Adventures (MSA) has been running youth programs on the island since 1998, and continues to bring thousands of students from around the Southwest to Catalina Island every year. Spending time in this beautiful ecological preserve gives youth a personal first-hand experience of the natural world, and from there – a personal appreciation and love develops. If it is true that we only preserve what we love, then MSA’s program is instrumental in providing the very experiences which inspire that very love for the natural environment in their hearts. 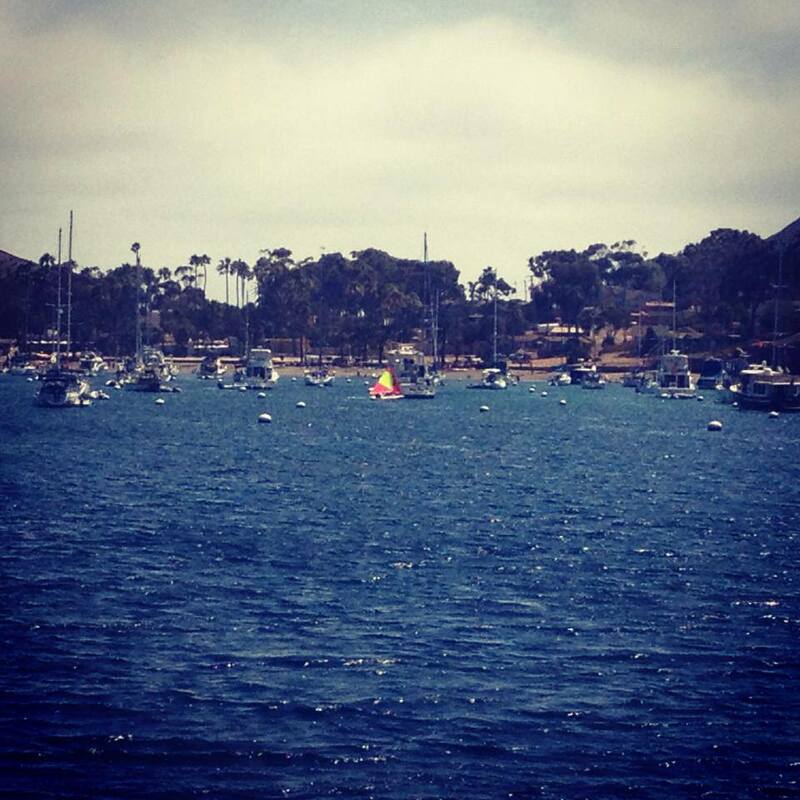 MSA runs their program at one of the most desirable and ecological diverse coves on Catalina Island, Emerald Bay. The facilities are just as impressive as the scenic beauty both inside and outside the beautiful emerald colored water. 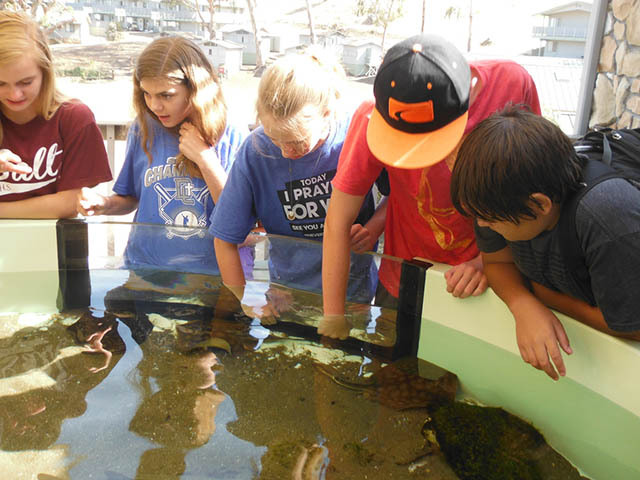 Resources such as the Pennington Marine Science Center, which has a salt water aquarium with displays of all the major ecosystems surrounding Emerald Bay, as well as multiple touch tanks, microscope labs and classrooms. Surrounding Emerald Bay is the natural beauty of the ecological reserve, maintained by the Catalina Island Conservancy, with endless scenic views of untouched island coastline, rolling chaparral hills, and an abundance of wildlife such as Catalina Island Fox (endemic only to this island), mule deer, bison, and a wide variety of marine and terrestrial birds, including bald and golden eagles, red-tailed hawks, ravens, and rare migratory birds that travel thousands of miles such as arctic terns. 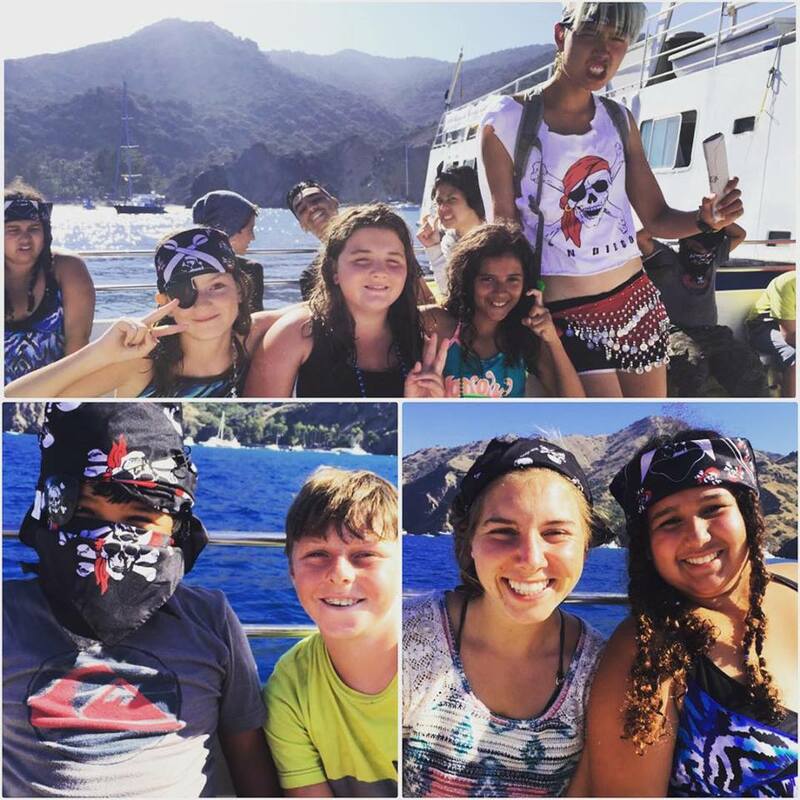 One of the reasons Catalina Island is such a popular and desirable location to take groups and classes for the camp experience is because it is just remote enough to feel like they have left the country (kids often times think this! ), but yet they are still in a safe, protected and well-connected, yet rustic location. Camp is a safe place where students can let their guard down and just ‘be kids’. They are free to play and discover how fun and exciting the world of natural science really is! Camp program is always an adventure, and the line between ‘academic’ and ‘recreational’ time becomes less and less clear. That is because learning is fun, and all it takes is placing children in the right conditions for that realization to take place for them. When ‘play time’ becomes ‘learning time’, and vice versa, students are ready to apply themselves and participate in the outdoor educational program activities with greater interest and enjoyment, and therefore gain much more from it. With this total interest, students are immersed into their environment, and with the tools given to them during the lecture phase by their instructor – they are able to observe and interact with their surroundings like true field biologists. Such full immersion into the awe-inspiring beauty of an ecological preserve like Catalina Island imparts the type of appreciation and love for the environment that transforms the student’s perspective for life. Outdoor education is unique in its capacity to ignite a love for the environment, not only do students immerse themselves in the great outdoors through the activities, but they are taught valuable information regarding the various animals they may encounter, as well as a method for observing, recording data and studying them. Students are both fully immersed and fully attentive, learning to observe their environment like field scientists. They then take their observations back to their outdoor classroom and develop testable hypothesis. In this way, the scientific method becomes a tool for taking their personal immersion into the natural world deeper and deeper. With such a rich personal experience of the natural world, students are often moved towards increasing their efforts to be more environmentally conscious and friendly. Those experiences at camp become deeply cherished memories, resulting in a deep love for these preserved places in nature. The vital importance of conserving them becomes increasingly more apparent. 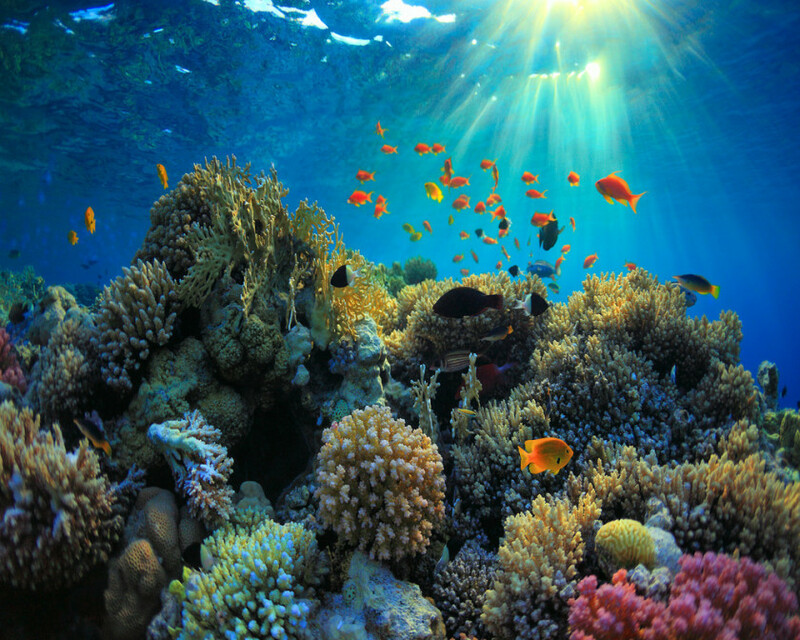 Coral reefs are known to be home to most of the world’s fish species, with these being known as hotspots of biodiversity. On top of that, both reef-living fish and most pelagic, open-ocean fish spawn in coral reefs, becoming the prime source of the fishing industry. Coral reefs also fixate dissolved nitrogen, making it accessible in the marine food chain, and ultimately contributed to fish biomass that the fishing industry hungrily seeks. However, not all of human efforts contribute to the benefit if the coral reefs, despite it being a vital aspect of our economy and biology. Besides the obvious effects of pollution, here are some of the anthropogenic activities that directly and indirectly detriment the world’s coral reefs. These are the anthropogenic acts that directly cause physical damage to coral reefs as a means for a greater catch. These include, but are not limited to, bottom trawling and the use of explosives. Bottom trawling involves the dragging of heavily weighted nets on the ocean floor, indiscriminately raking benthic organisms, including age-old and slow-growing corals. Larger fishing vessels employ this method to efficiently and effectively catch large amounts of fish in as little time and concern for the environment as possible. Naturally, this method is unsustainable, as fish would lose their spawning sites and habitat faster than it would regrow, effectively inhibiting the repopulation of the fish of the area. Explosives are used in small to medium-scale fishing, as these methods are less efficient than bottom trawling, but does not require the use of large fishing vessels. Explosives are primarily used to cause shockwaves aimed at destroying the calcareous structure of corals, and secondarily to destroy the fishes’ swim bladders. These two added results would then give these reckless fishermen an easy catch. Does the term “agricultural runoff” sound familiar? Chemical compounds used in agriculture, such as fertilizers and pesticides, are “run off” to sea, as an accident or an intentional endeavor to use the world’s oceans as a waste pond. These chemical compounds foreign to the coral reef ecosystem cause disruption by either the killing off or causing the uncontrollable growth of certain organisms. As such, the natural nutrient cycle is disrupted, or the overriding of algae causes the stifling of resources for other organisms. Let us first provide examples of the effects of introducing large amounts of foreign chemical compounds to the coral reefs that immediately lead to death of certain organisms. For example, a farmer’s waste pond full of herbicide overflowed due to excessive torrential rains, and drained to a nearby river, which eventually led to the ocean. The large amounts of would immediately cause the death of phytoplankton and sea grass communities. Oil spills will cause the reduction of light reaching the benthos, stifling the corals’ zooxanthellae of their and their host’s means to survive, grow, and reproduce. Now, we illustrate the effects of the introduction of large amounts of nutrients to coral reef waters, which is also known as “nutrient loading”. First, we consider that algae are competitors of corals in substrate and light. Also, algae grow and multiply at a much faster rate than corals. Why don’t algae naturally dominate coral reefs? It is because coral reefs are low-nutrient environments. Now, the introduction of nutrients to these coral reefs would then cause the rise of the biomass of algae in the area, which is also known as “algal bloom”, which subsequently stifles the resources needed by corals, leading to the reduction in the population of corals and all other organisms depending on them, and ultimately leading to the phase shift of the community. The increase in the amount of sediments suspended in the water column will trigger corals to secrete mucus in order to rid themselves of sediment. However, the corals will use up valuable energy in doing so, making them more vulnerable to disease and would slow their growth. Also, in the even of the coral not secrete enough mucus to get the sediment off fast enough, then the light going down the water column will be again restricted, yet another stress for the corals. Lastly, sediment will smother the coral, and will prevent the entry of the suspended particles corals do need to survive; food. The increased amount of suspended sediment in the water column may be attributed to natural causes, wherein sediment upwelled by water currents as a natural part of reef ecology and healthily adds optimal amounts of nutrients to the reef, and by anthropological activities, which usually leads to the negative effects mentioned above. This may include the activities that, as a side-effect, causes nearby land to be more vulnerable to erosion, such as deforestation and mangrove-cutting and the activities that directly add sediment to the waters, such as the dumping of land from construction projects. With all of the recent talk about protecting the oceans, there is increasingly more and more momentum to learn what we can do to help from our coastal and inland communities. People are rallying together to end practices that are devastating to the environment; despite all of the conservation laws that are on the books, there are still practices that are used which damage the oceans and destroy fisheries. Most people learn more effectively if they experience something first hand. That’s why Mountain and Sea Adventures provides experiential learning programs for their students, along with teachers and chaperones who want to learn more about ocean conservation. The four major oceans on the planet are home to diverse and distinctive ocean creatures. These animals are simply not just the usual fishes or whales we know, but also cephalopods, crustaceans, plants, and even birds. Some of these creatures are on the brink of extinction and many are endangered due to negative human impacts on the marine environment. In order for the abundantly and extremely valuable resource of the ocean to be around for future generations it is important we make sure that we are taking actions that are sustainable and do not allow for bad practices to continue negatively affecting the oceans. As consumers, we all need to make the shift to promoting ocean conservation by reducing our plastic consumption, using biodegradable products, and picking seafood that was harvested or raised in a manner that helps the oceans to rebuild instead of destroying them. Individuals and some organizations, have contributed greatly in the efforts to save our oceans. However, while their works are helpful, they cannot do it alone. People like you and I have to do our part in protecting this diverse ecosystem. There is also a great amount of damage that gets done to the oceans with the usage of industrial fishing techniques. Many sea creatures find that their habitats are being destroyed. The good news is that there are more and more options for sustainable seafood for folks who want to be eating from the sea in a responsible manner. So, what can individuals do in order to help save the ocean? First, we should encourage awareness by studying and sharing ocean facts. Education and learning will encourage awareness, which in turn will promote its preservation. Academic institutions and organizations have conducted substantial studies of different ocean conditions, and information is widely accessible for those who want to learn more about this and contribute to finding viable solutions. In addition to that, it’s always best to start when young, that’s why parents and teachers should take their kids/students to environmental educational programs that are focused on imparting a love for conservation. MSA’s programs offer youth useful and fun environmental education activities that students will find incredibly interesting to learn. 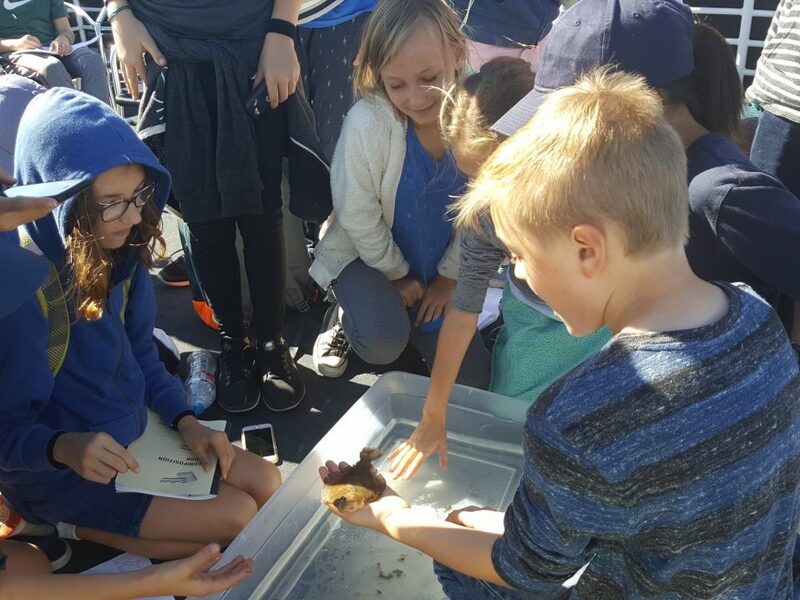 Kids, teens as well as parents and teachers, can get up close and personal with the marine environment when they attend our programs at Catalina Island or Camp Oakes, Big Bear. It is an adventurous program that is both educational and enjoyable for everyone. The importance of bottle water cannot be overlooked. Please think for a moment about how many people you saw today with a bottle of water and then think of that on a global scale. Those bottles alone would create a staggering pile of dump. Buying a reusable water bottle from the store and filling it up at home from a larger bottle will not only save you money but it will decrease the amount of plastic products purchased on a regular basis if everyone does so. This not only cuts down on garbage but it cuts down on petroleum based consumption. Plastic products are not biodegradable and will not go away with time but we can shrink the numbers of them in our landfills and in our oceans by not purchasing as many of them. Another easy way to cut down on waste products is to carry reusable shopping bags. How many times a week do you go to the store and walk out with more than you even planned to purchase. Filling more plastic bags than you can use, and in turn creating more waste than necessary. Runoff from the streets goes somewhere, does it not? In coastal areas more times than not, it goes to watersheds and ends up in the ocean. When you walk down the street, clean out your garage regularly, or wash your car in the driveway always be conscious of what goes down the gutters. If you see trash when out in your neighbourhood do not forget to pick it up. You are taking care of your home and our planet by doing so. Millions of pieces of garbage are unnecessarily allowed to float their way to the coast and add to a growing pollution problem in the oceans. We can all make a difference and every little bit does count even if it not evident at times. Always reuse resources that can be reused and cut down on those that you do not need to consume. You can also look into supporting many non-profits organisations that support education, conservation, and environmental protection. The “Gyre” of waste in the Pacific is just one example of marine pollution that exists today. 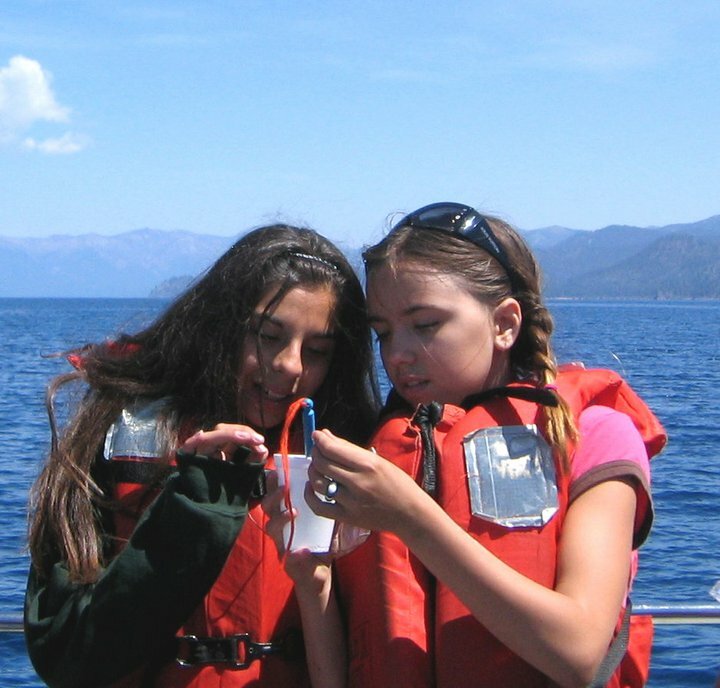 Mountain and Sea Adventures (MSA) educates thousands of students from the southern California area every year. Do not forget that this planet is our home and it will only remain a healthy and beautiful place if we all take steps to conserve and foster conservation and environmental concern in those around us. Take the time to make a difference and be conscious of the choices you make today knowing they do have an impact on all of us and other organisms that call this blue planet home. What Is El Nino Weather Pattern and Why Is It Important To You!? The El Nino weather pattern is usually characterized by abnormal warming of the waters around the month of January. We see images of dried-up wells, cracked form grounds, as well as resulting periods of long drought. There is also a rise in temperature, which in turn creates a change in the weather conditions with sometimes cause some serious environmental and even economic impacts. In the sequence when trade winds die out and ocean waters become unusually warm, an El Nino weather pattern occurs worldwide. El Nino is can be clearly defined as “a disruption of the ocean atmosphere system in the tropical pacific having some important consequences for weather and climate around the world” as defined by the National Oceanic and Atmospheric Administration (NOAA). It has a significant effect on both the Atlantic and Pacific hurricane frequency with an average duration lasting between nine to twelve months in the year. It occurs infrequently which cannot be predicted, somewhere between every two to seven years. Some refer to it as “Godzilla” due to its possible effects on climate change. Among the climactic effects of El Nino are shifts in the standard paths of typhoons, causing draughts in some regions, and even flooding at other regions. Most times El Nino had partly been blamed for the forest and brush fires in some countries. Even some temperate regions are not left out from this change of weather patterns as countries like US, Canada, Japan and Korea. Their winter months have been generally reported to be colder than usual and with higher than normal snowfall. A lesser known fact about El Nino is that it actually slows the rotation of the earth by affecting air currents surrounding the globe. But do not worry! It’s only by an extremely small fraction of it and not enough to change your daily routine, nor can it affect things such as how an airplane flies. In reality El Niño is just one phase of a two phase system. La Niña is the counterpart to El Niño, yet receives much less attention. Therefore the oscillations of temperature anomalies asymmetrically bare the name el Niño. Historically la Niña has proven to be more consistent which makes weather-men happy because they get to be right more often than usual. Regardless of where you may live in the world, you may experience a drier or wetter climate than usual due to the El Niño weather patterns. If you live near a coastal region, hurricanes or tropical storms could impact your life more during the next year. Is it only all about the ocean? Off course, with 71% of the earth’s surface covered with water and 96.5% of that water are held in our oceans, it would be a hard argument to dispute the effect water has on our general climate. El Nino is a proven fact to this not a theory, however, theories do abound with scientists on exactly how this weather phenomenon works. The Peruvian anchoveta fishery, which is the biggest single species fishery in the world, typically collapses during El Niño events. In normal years, several million metric tons of fish are harvested from this region off the coast of countries like Peru. But during months like December, January and February, it is unlikely the fish are going to be abundant, which will have devastating impacts on the economy and industries that depend on the anchoveta fishery. Also off the coast of North America, there will be declines in some fish stocks, specifically in the cold water fish stocks, like anchovy, that are important prey for a lot of species of fishes like tuna, whales, sea birds, seals and sea lions. So the loss of the anchovy off North America will also impact those higher predators too in the chain. For most people, the Spanish words El Nino (“little child”) and La Nina (“little girl”) are simple, nice and harmless words. Who would have thought they mean agricultural trouble rising temperatures and erratic weather patterns? However, weather patterns associated with El Nino and La Nina have completely changed the coffee growing season in Peru. This single weather fluctuation is Peru’s challenge and a big reason why this country struggles to be a leading coffee world producer. What About Impacts For Beach-Goers And Coastal Communities? Thanks to El Niño, beachgoers have more to worry about than shark attacks and a deluge of sewage and plastic as highly venomous sea snakes are usually washing ashore too. Sea snakes do not travel well on land and it’s hurting more wildlife than just one scary snake. Also thousands of crabs have found their way to shore in beaches in this period. Prompted to travel north owing to El Niño–triggered warm weather, the crabs struggle out of water, leaving the beaches coated in dead red crustaceans. Seabirds are also affected as they begin to die at an alarming rate at the seashores. As a result the waters has pushed the fish deeper into cold waters, and the birds simply can’t reach them. A host of marine animals feed on phytoplankton, including whales, jellyfish, and shrimp. As El Niño weakens upwelling of cool nutrient rich water to the ocean surface, the amount of phytoplankton decreases for them to eat. Because phytoplankton make up the bottom of the oceans food web, decreased supplies affect not only the fish that eat them but those animal predators as well. The appearance of dangerous animals like hammerhead sharks due to an increased hunt for food sources, mainly smaller fish and squid. 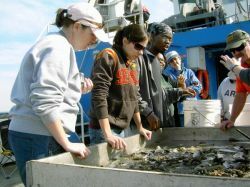 Here students observe live marine life brought up in a trawl. Climate change can be defined as a change in climate variables, especially temperature and rainfall that occur gradually over a long period of time between 50-100 years. The changes caused by human activity (anthropogenic) should be understood, especially those related to fossil fuel consumption and over-land. These changes caused by natural factors, like additional aerosols from volcanic eruptions, are not accounted for in terms of climate change. So the natural phenomena that lead to extreme climatic conditions such as cyclones can occur in a year (inter-annual) and El-Nino and La Nina, which can happen in ten years (inter-decade) cannot be classified into global climate change. Human activity has led to this imbalance especially in the form of carbon dioxide, methane and nitrous oxide. These gases then affect the temperature increase. Climate change has a very profound effect on our day-to-day life even if we do not think about it. Recently we are seeing instances where our weather patterns have changed and there is an increase in erratic climatic conditions all over the globe. The sudden climatic changes that are occurring have been attributed mainly due to global warming. All over the world there are many countries that are underdeveloped and have extremely poor waste and sanitation management systems. Of equal importance and impact are the fully developed countries that have booming economies, and as these countries concentrate on their growing economy our planet is left behind in a the wreckage. Part of the issue is that we have allowed our corporations, governments, and even ourselves, to neglect the environment, and slack in our duties and responsibilities as environmental stewards. Now climate change is becoming more and more self-evident. In the not so distant past, people were able to live comfortable lives as they were adjusted to the climate and environment, but our own activities have caused the climatic changes, which are leaving us very uncomfortable and already causing great crises for many coastal communities. MSA instructors introduce the students to our large-scale compost system at Camp Emerald Bay, Catalina Island. The temperature during the summer is on the rise and some places are experiencing very harsh winters. Ocean temperatures are increasing, causing massive change to currents, marine life and habitats. The effects of climatic changes are affecting people, wildlife and each one of our personal environments. In basic terms, defining global warming is often stated as ‘the increase in temperature of the earth’s surface and atmosphere’. The major reasons cited of climatic change are the burning of fossil fuel, the greenhouse gases released in the emissions from houses, factories, cars etc. This in conjunction with massive decrease in forests in nearly every nation around the world has left the current state of planet Earth in poor health. These increasing climatic changes have caused the melting of glaciers in the Polar Regions (Antarctica), with the occurrences of large number of hurricanes, tsunamis, high variations in climate change in the rainfall distribution etc. in recent times due to the increase in temperature there have been formation of high and low pressure regions which have caused these conditions. Through carelessness and ignorance we have allowed the conditions to persist that allow for on-going severe climatic changes, thereby causing destruction to our own property. Hurricanes, rising ocean levels, drought and other changes have been devastating to both man, animals and native vegetation. Is There A Serious Threat? Due to this sudden change there has already been a great destruction of property, loss of many lives, occurrence of diseases, floods etc. around the world. Another effect of global warming has been that due to depletion of ozone layer, there is no barrier again to prevent the harmful rays from the sun. Thus making the temperature increase and also increases chances of skin cancer due to the ultra violet rays. These rays sometimes can also create mutations which will be transmitted to next generations and can cause genetic disorders. The melting of ice has led to slow increase in the sea level and if this persists, it will lead to complete submerging of many islands under the sea in the future years to come. Starting from the agricultural sector, all agriculture will be affected through the reduction of food productivity caused by the increase in cereal sterility, availability of water, reduction in area that can be irrigated and decrease the effectiveness of nutrient absorption and the possible spread of pests and diseases. In some places in the developed (high latitudes) increase in carbon dioxide concentration will increase productivity because of increased assimilation, but in the tropics that most developing countries, an increase of assimilation was not significant compared with respiration which is also increased. On the whole, if adaptation is not done, scientists estimate that the world will experience a decline in food production of up to 7%. However, with continued levels of adaptation, meaning high costs, food production can be stabilized. In other words, stabilization of food production on climate change will cost us very high, for example by the improvement of irrigation facilities, provision of inputs (seeds, fertilizers, insecticides / pesticides) added. Like in Indonesia, the scenario of co² concentrations has doubled the current rice production. Warmer temperatures will cause a shift in vegetation species and the ecosystems. Mountain areas will lose many species of original vegetation and will be replaced by lowland vegetation species. Along with this the condition of water resources from those mountains will also be susceptible to interference making it hard to keep the original vegetation. This impact is not so apparent in the low latitude areas or low elevation area. Indonesia provides another curious example as more and more forest fires are becoming common; most (if not all) incidents of forest fires are caused by human activities either directly or indirectly associated with land clearing. These fires occur in conjunction with the El-Nino events because this phenomenon provides the dry weather condition that helps the occurrence of fire incidents. Also increasing of population makes pressure on water supply, especially in the urban areas. At the moment there are lots of urban residents who have difficulty getting clean water, especially those who are low income, uneducated and unskilled. The impact of climate change which causes changes in temperature and rainfall will have an impact on the availability of water from the surface runoff, groundwater and other reservoir shapes for such people. 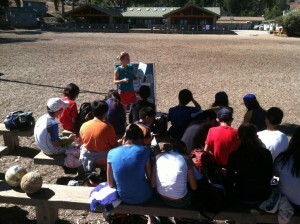 MSA instructors impart their passion for natural science and teach the students about environmental stewardship. The harsh effects of the climatic changes have made people to think about the reasons for the importance of global warming. It has caused an increase in the effort by people to reduce global warming by switching to different energy source other than fossil fuels, recycling, planting trees, electricity conservation and even awareness programmes. Indeed, nobody can do everything, but everybody can do something, and even the littlest efforts all add up. Even all the governments or the world are now signing treaties and under taking projects to reduce global warming and thus prevent severe climatic changes. If we want to ensure that there are no more adverse climatic changes then we need to take a bold step to prevent global warming so as to ensure that earth is a place to live for the next generation.